Sears, a 125 year old company is now a penny stock. Interestingly, the host of marketplace said the highest stock price for Sears was reached in 2007. A cautionary tale about buying individual stocks, no matter how long they've been around. William Sharpe once said "The three most important things in real estate is location, location and location. The three most important things when it comes to investing is diversify, diversify, diversify." Re: Sears, a 125 year old company is now a penny stock. The Sears mail order catalog was the Amazon of a hundred years ago. An interesting lesson in how times change. Sad to see them as a penny stock but you're right about diversification and individual stocks. The 2003 start was the remains of Kmart (after it had gone bankrupt) came out, then went deep into debt to buyout the former Sears. Last edited by JoMoney on Fri Sep 28, 2018 8:38 pm, edited 1 time in total. Last edited by chambers136 on Fri Sep 28, 2018 8:48 pm, edited 1 time in total. Sears was the Amazon.com of the 19th century, taking advantage of the new technology of the railroad system to sell things by mail order catalog. Changes in retailing are a part of how such a legendary company came to be in this sad condition, but they're by no means the entire story. Keep this in mind whenever anybody starts saying that a portfolio of a few good blue-chip stocks are not risky, if they are stocks in truly great companies, household names, that "aren't going to go away." Because "everybody will always need" refrigerators, sensible clothing, and durable tools. If you owned Sears continually since the IPO in 1906, you would probably have done fine collecting the dividends, assuming you didn’t reinvest them, and may have done better than fine with spin-offs that eventually became Allstate and Morgan Stanley. 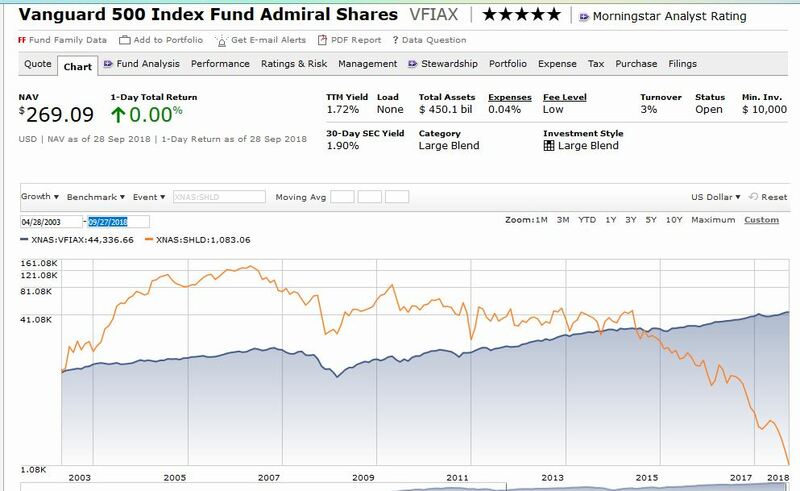 Maybe not as well as owning the Dow or SP500, but index funds were not an option back then. My point is that it’s not like you would be back at 0 after 100+ years of ownership. Of course, amazon (the closest analogue to Sears in 1906) does not pay dividends. Not bad. Talk about an interesting case study. How have they managed to stay in business this long with such poor prospects and finances? Impressive. I'm really surprised they've lasted this long. I figured they would have been dead 10 years ago. Back in 2000s all the CNBC-type pundits talked about how, despite their retail business dying, they had "great and valuable real estate holdings." Every Sears location I can think of that has existed within the past few years is/was at a dying mall in an area with declining economic demographics, so I don't even think their RE holdings are that valuable. Sad. I bought a canister vacuum from Sears in the 1980s. About five years ago the hose that connected the canister to all the attachments sprang a leak. I was pleasantly surprised to discover that Sears still stocked the correct replacement part, with the right electrical connections to the motor in the carpet attachment. (It was a different color, but I can live with that). Sears is as much a victim of being a leveraged buyout that gutted the company as changing times. I would imagine Sears like just about any other public company around 100+ years paid out multiples of the original investment in dividends and had many spin offs of other companies you would have received shares in. probably special dividends as well that need to be tracked. I don't really see it as a cautionary tale but a long enduring and once great company. I agree - but perhaps the hand wringing should have started once the leveraged buyout occurred? It's both sad and completely inevitable that Sears is currently in the toilet. I don’t think it’s sad. It’s normal. In, fact, it's great. Sears is just the name of a company that provides goods. If they don’t do it well they go out of business and are replaced by another company with another name. And consumers are better off. Just had an impulse to go out and buy some. Must resist. I don't see this as a cautionary tale in common stocks at all, just a lesson in paying attention. For the first half of my life Sears was my "go-to" store for just about everything- clothing, housewares, I had nothing but Kenmore & Craftsman, didn't even shop elsewhere. After bad experiences, first I stopped buying their work clothes, then their appliances. That got me in to other stores, and the spell was broken. I don't know if they could have survived the big-box trend, in fairness probably not, but I would have continued a loyal customer if justified. If I'd owned their stock, I'd have sold it 7-8 years ago when I threw out the 3-year-old lawnmower and dehumidifier. The recent stuff about the wacko venture capitalist owner looting the company was an epitaph fitting to the era. I understanding what you're saying from a rational and pure economics standpoint, but Sears has this emotional component to it for me. I remember going there as a kid with my parents to get school clothes, video games, etc. A place filled with childhood memories and adult ones too....my toolbox is full of Craftsman tools. I actually got some of the links in my post above by doing a Google search whose entire terms were the two words Sears plundered. They even sold houses at one point! How crazy is that. And now the company is almost ready to be a memory. Sears was a fine go to store for almost everything. Then it got ruined by a stupid greedy capitalist who thought people wouldn't notice he'd jacked up the prices of everything when they were cheaper elsewhere. Not the first company wrecked this way. If markets are efficient, is the expected risk adjusted return of Sears and Amazon stock the same? who cares? expected risk adjusted return isnt a real thing. it isnt an objective thing. it's the figment of the imagination of economists. its fairy dust. I remember soon after I started trying to figure out investing I watched Jim Cramer on CNBC say that Eddie Lampert was going to transform SHLD into the next Berkshire Hathaway. Not knowing any better I bought a few shares. Fortunately it was a relatively cheap lesson and I found the Bogleheads and other more useful resources not too long after. YES, that was a great episode. I loved the part about the hobbyists who go around trying to spot and catalog all the Sears houses. There was no record kept, and because successive owners kept remodeling and modifying their houses, it takes an educated eye to spot them. There was quite a lot of interesting business-related material in the show. The one that struck me as incredibly brilliant, was that for a long time Sears and Montgomery Ward were giant competitors in the same business, and both put out giant catalogs. Many homes (including ours) had both catalogs sitting around the house. They were quite bulky and heavy. Sears, the show said, deliberately made the page dimensions of their catalog slightly smaller than Wards, so that homeowners, tidying up, would always put the Sears catalog on top of the Ward's catalog. The other fascinating detail is that part of their success in selling mail-order kit homes was that they also extended mortgages, and made homeownership possible for many African-Americans, who could get mortgages from Sears for kit homes when they were being red-lined by banks. (And then, of course, that turned out badly for Sears when the Great Depression hit and people couldn't make their mortgage payments). Probably. The thing with the company now called sears is that upside is all in a couple of outlier cases (i.e. the company turns around and goes up 100x) which only happen every 1 in 1000 time. You need to make a lot of bets to see that outcome. I've known for some time that Sears sold houses by catalog, but I learned a lot from this podcast. It was especially interesting to me because my wife and I nearly bought a Vallonia last year that we loved, but didn't have the time or resources to give it the work it needed. When I was in high school the exhaust system of my car rusted out. Ordered a whole new exhaust assembly from the Sears Catalog. They had everything. Edit: The company has had quite a decline. Previously Sears Roebucks & Co., it owned Allstate Insurance, Dean Whitter, Discover Card, and many more. The present SHLD (Sears Holdings) wasn't formed until 2005 when Sears merged with Kmart (another declining retailer). Eddie Lampert must be loving that hard to borrow short interest. You don't have to be a major shareholder in a profitable, growing company. Just keep a doomed company on life support and lend your shares. Alas. I miss the retailers such as Sears and Montgomery Ward, and when others go I will miss them too. Well, I miss what they were in their heyday. I don't miss what they have been for the past couple of decades. It does indeed argue against stock picking. Incredible! To think during our stock picking days we invested in Sears! I know. It really does not matter what company! An investment in individual stocks has a completely different set of risks to consider. Even before the Internet, maybe early 80's (late 70's ? ) Sears management starting driving their stores into the ground. True of many retail companies, they cut wages and try to sell you cheap crap on every aisle. You can watch greed slowly destroy great companies. I have bought Kenmore and Craftsman for 40 years, it is sad. The local JC Penneys has been remodeled (by some idiot consulting co. I'm sure... it's a maze) and it's a poor excuse for a store, like Walmart poor or no training and low wages, they love desperate poor workers, service is such a rare thing...they drive you to the internet. I remember working at Sears during my senior year in high school. Christmas time was jammed packed with families spending money on what they thought was cheap credit, @ 28% compounded annually. I recalling this shocked us at the time. High inflation does horrid things to the economy. In my mind anyway. Looking forward to seeing the same thing happen to Amazon, and hopefully in less than 125 years. Sears pretty much transformed itself from a mail-order catalog store into a brick-and-mortar department store during my childhood years. In elementary school, my clothing came from the Sears (or Montgomery Wards) catalog. By junior high school (mid-1960s), we had a large Sears store five miles from home. Initially the transformation was a huge success, but I suspect they had far lower overhead before the transformation. Hope Amazon realizes the risks of brick-and-mortar. Last edited by UpperNwGuy on Sat Sep 29, 2018 2:47 pm, edited 1 time in total. Remember their muffler, the "muzzler" with a lifetime warranty. I put it on my first pickup, which I kept for 28 years and never paid for another muffler on it. Sears auto repair business was not always successful. The muffler and the battery were success stories. The tires were terrible. In 1972 my parents gave me their 1965 Oldsmobile equipped with four brand new Sears tires. Three of the four tires failed (bubbles in the sidewall) within a year. Without any sort of death wish for Amazon, I have found myself buying much less from them compared to two years ago. A lot of other online retailers have upped their game, so I can usually find a better deal elsewhere. I even let my prime membership lapse, which I used to consider a standard expense like renewing my car tags. Now that Amazon seems to be moving into the brick and mortar retail world, it will be interesting to see what they do there, and what new technology/business comes along to offer something better. beardsworth wrote: Changes in retailing are a part of how such a legendary company came to be in this sad condition, but they're by no means the entire story. - no business and no business model is bombproof. Think how railways have declined in the last 118 years from when they were the largest part of the US index in 1900. It's not that we ship less by rail now than we did, then. It's that technology and markets have changed, and railways just could no longer make supranormal profits. Think of all the great franchises of the 20th century, unbeatable in their time. RCA and radio networks in the 1920s and 1930s. The big 3 TV networks from 1950 to the 1990s - licenses to print money. Kodak film processing. Xerox copiers. AT&T (the first time round). etc. etc. Think what happened to Fairchild, which actually invented the semiconductor -- the bright young people left and founded Intel. Then Intel if it had "stuck to its knitting" and stayed mired in memory chips-- it would have been commoditized and destroyed. Instead an internal coup allowed it to go into microprocessors where it became the dominant player in the age of the microcomputer. However it is now struggling in the age of the smartphone. Think Yahoo, once the titan of the internet stocks. This article from last year is very illustrative about what is going on inside Sears. Some investors (e.g. CNBC's Jim Cramer) thought that Fast Eddie would transform Sears into some sort of real estate hedge fund while turning the retail around. But instead, Sears has a CEO who terrorizes the senior executives in Illinois via VTC from his south Florida palace until the talent is gone. Sears owned a lot of its own stores (even in many malls) and has been selling that off. The Kmart real estate wasn't quite as valuable and combining the two stores never made great sense. About 10 years ago, the Craftsman hand tools made in USA started to be replaced en mass with new editions made in China. Quality slipped. The markups in hardware are much less than the "softer side of Sears" but was still very profitable and even better it brought the rest of the family in the store to shop in the clothing/jewelry/electronics/appliance divisions. Sales "associates" were paid on commission (straight for Brand Central, partial for hardware, sporting good, paint, etc.) and motivated to sell. Sears used to make more money on their credit card business than their stores, but aggressive debt collection practices strayed into illegal territory, inviting big fines from the government. Sears sold the pieces off of the National Bank of Sears to Citibank years ago. They also spun off Dean Witter, Discover Card, Allstate, Coldwell Banker and others. Remember Prodigy (first a standalone online service, later an ISP)? It was originally a JV of Sears & IBM. My wife and I were at the mall today and walked through Sears. It was depressing because barely anyone was there and the store looks old and out of date. The fate of many retail stores. If you could somehow virtually try on a pair of shoes (i donno...scan your foot somewhere) and have a 95% accuracy rate, that would remove nearly most shoe sections in stores. Knowing the shoe size isn't enough in my opinion because even if they fit they may not be comfortable depending on the manufacturer.